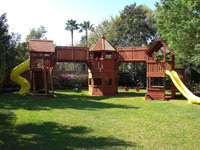 Custom Treehouse Playsets, Tree House Decks and DIY Playset Fort Design. What the heck is Jack's Backyard? Let's start with the basics. This website does not represent a big company with in-stock products, materials, employees, catalogs or products on display. Most items you see on this site, other than the redwood playsets and treehouses, are made from reclaimed natural wood sourced from old wooden swing sets and whatever falls into my woodpile. Every wood product you see on this site is made by hand one at a time and each piece is distinctively unique and made with passion and purpose. Jack's Backyard is a collection of 21 years of work meant to showcase my talents, show what can be done with reclaimed wood products, and offer people the benefit of my vision through inspiration and DIY plans. These are my favorite backyard projects. It's a vast leap from building custom playsets that are perfect, plumb, and square to building a treehouse deck. The tree is imperfect and resists efforts to make it do anything other than be a tree. The trick is to work with the tree and its natural curves. A great custom treehouse does not come in a kit and the simplest plan can be derailed in the first 10 minutes because the tree says no. My custom tree houses are mostly in Austin and Houston, Texas. Half the fun of a custom build is the challenge of starting with a blank slate and a wish list. It's the root of my builders passion. My philosophy is, "It's mine until I give it to you". My clients usually get a crude drawing of an agreed plan and 1-3 months later they have something specific to their family needs, built with quality and craftsmanship not typically seen in backyard wood forts and swing sets. Get inspired and build a redwood playhouse, a cedar loft or some other cool DIY outdoor project. 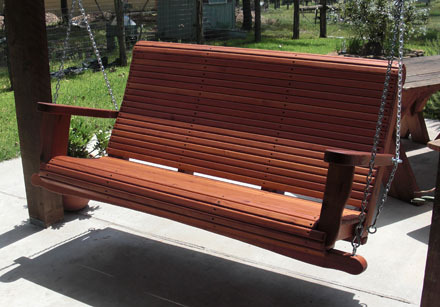 Home made wooden playsets and swingsets, while designed and built with the best intentions, are under or over-engineered, made with entrapment areas, exposed bolts, or inferior hardware. Why do more work than you have to? All of my DIY playset plans are refined for simplicity and voluntarily meet or exceed all safety standards set forth by the American Society for Testing and Materials and the Consumer Product Safety Commission. A new line of home DIY project plans is coming soon. Want something different? Ikea style not your style? Get Inspired and Build your Own Style. Anyone can build the things I build. The cool products you see here are all made from wood found on the side of the road, lumber from playset manufacturers warranty replacement parts, or wood pieces from my scrap pile. If you have an old barn or an old wood pile and think it might burn pretty good, you should take a look at some of my reclaimed wood projects and get inspired to make shelves, chairs, porch swings, planters, wood mailboxes or maybe a new must have product. You'll be surprised at what patience and some hand tools can create. Take a look around, get the building bug, innovate and re-use your lumber.